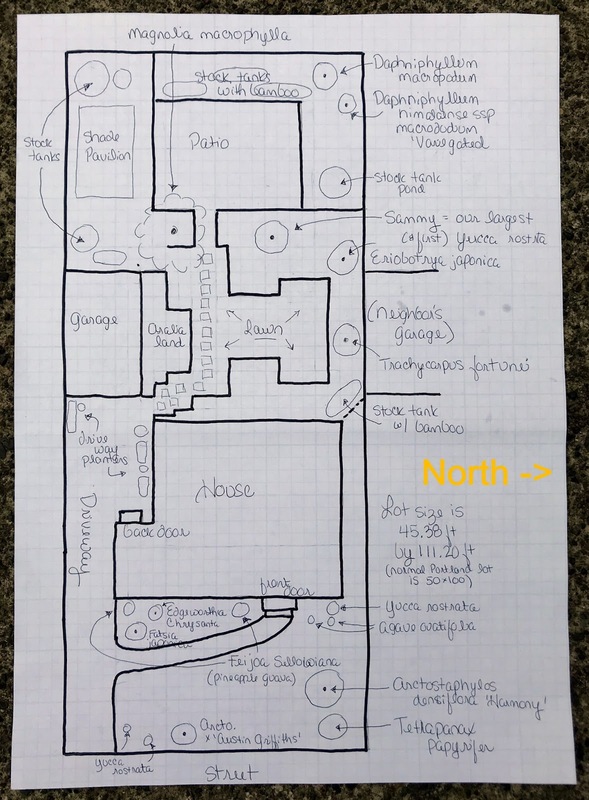 Going through and organizing some files the other day I found this odd little map of the garden that I drew for Jennifer Jewell before appearing on her podcast Cultivating Place. She'd asked for a general layout with "important plants" called out, so that's why some things are featured and others not. 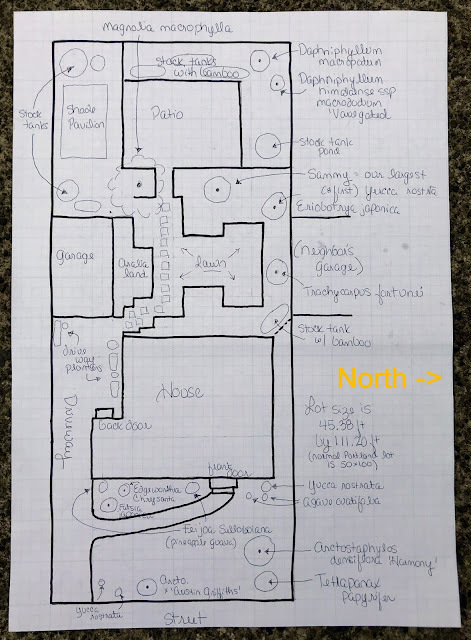 Understandably, my blog readers who have not visited the garden in person frequently mention they don't understand the layout, maybe this will help? On that note I just have to share some amazing posts my friend Gerhard recently wrote (and photographed) about the garden. They're so much better then my 2018 tour posts! Like the map! It helps; however, I'm curious as to the approximate size of your lot...Maybe you've posted that somewhere else and I just didn't see or remember it. Thanks. Glad you found it helpful! There is a note on the map about the lot size, right under the bright orange word north. You're welcome! Since I didn't really draw the map with this use in mind it's a little hard to read. Looks almost as good on paper as in person. Thanks for the link to the podcast! Started listening but am looking forward to hearing more. I should have listened again, just to refresh myself on what I said before I linked again! The map is very helpful for understanding the whole layout. G's posts show your garden well. I'm convinced that visitors see a different garden than we do. It is always nice to see their POV. Your garden is much larger than I suspected. No wonder I keep seeing plant after plant that I hadn't seen before. I like seeing this layout. It helps tremendously. Now that's something I don't think I've heard before! Larger eh? That was a great podcast! I'm disappointed you didn't draw it in 3D - those awesome level changes are the BOMB! ;) Also, very much looking forward to reading/seeing Gerhard's posts. The level changes are a big part of what I love...but I don't know how to draw in 3D! I guess I could have done an elevation. It's a wonderful map! Looking at the neat rectangular shape of your lot suddenly made me realize why you may find the flow of my garden so difficult to understand. Our lot is anything but rectangular - I can't even refer to a standard geometric shape that would describe it. It's 6-sided; none of the sides is of equal length and some vary dramatically; and one side (along the street) is deeply curved. I loved your podcast but I think I told you that before. I'd gathered your lot was rather free-form, I'm not sure if I would enjoy that, or find it super challenging. I love this map. I have always been fond of maps, and because I have been there it is fun how my brain can visualize the environment when I look at your drawing.The map also displays how every square foot is planted. I know that feeling ! At least I still have some concrete I can remove. One of these days, I would love to see it in person. Maybe next year. I have not been down to Portland region to just visit gardens. It's time I do! I actually drew a few along the way, but who knows where they've gone! Nothing like a bird’s eye view for everything to spring into focus. Love it. I wonder if I'll ever post a drone's view?